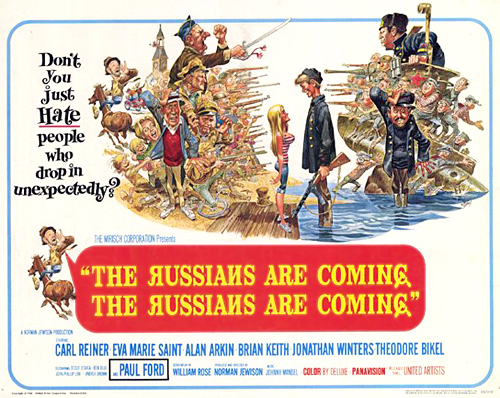 I recently had the opportunity to see Norman Jewison’s extremely silly and sometimes smart 1966 comedy The Russians Are Coming, the Russians Are Coming for the first time in about 20 years when it played on TCM. When I was a kid The Russians Are Coming, the Russians Are Coming was one of my favorite comedies for reasons I can’t really explain, except it seemed to portray adults as I saw them then – easily frightened big kids who projected their fears onto their children and conformed to every bad idea that society and the government tossed their way. I was afraid the film wouldn’t hold up after such a long period of time between my last viewing so my expectations were extremely low going into the movie but once it ended my appreciation for it remained. I really admire its undeniable charm and the way it manages to cram complex ideas into easily digested entertainment that the whole family can enjoy. Simply put, it’s a lightweight version of Kubrick’s brilliant Dr. Strangelove (1964) and it works. The Russians Are Coming, the Russians Are Coming opens with a Russian sub running aground in a small New England coastal town. Naturally chaos erupts because the U.S. is in the middle of the cold war and only four years have passed since the infamous Cuban Missile Crisis. The Americans think the Russians are invading and the whole town pulls out their guns and comes together to form a modern day militia in an effort to stop them. Of course things aren’t exactly what they seem since the Russians in the sub are merely trying to get back home. After bouts of hysteria and plenty of violent outbursts, the panicky town’s folk and the frazzled Russian soldiers manage to come together to save the life of a young child in peril and the sub returns home. There are some standout performances in The Russians Are Coming, the Russians Are Coming, including Carl Reiner’s terrific turn as a comedy writer trying to calm the paranoid town and the very funny Alan Arkin playing a smart Russian Lieutenant who’s trying to get a handle on the slowly escalating events all around him. Brian Keith is also very good as the town Sheriff who can’t believe the situation he’s found himself in. Arkin’s Russian Lieutenant and Keith’s small town Sheriff could have been roles written purely for easy laughs but they’re not. Viewers are asked to sympathize with both men in some ways and we do. The gorgeous John Philip Law also shows up as a Russian solider who speaks a little bit of English and ends up falling for a perky American blond played by Andrea Dromm. The two young lovebirds make a cute couple and their romance echoes themes found in Shakespeare’s classic play Romeo and Juliet, which gives the film an emotional core that I personally found rather sweet and appealing. The beauty of The Russians Are Coming, the Russians Are Coming seems perfectly clear today as we deal with some vaguely defined idea of an enemy we’re supposed to fear enough to give up our Constitutional Freedoms and basic human compassion for. The film has often been unfairly criticized for its dated jokes, simple plot and silly slapstick style humor. But if the ideas presented in Norman Jewison’s film are so dated, simple and silly, why are people still making the same absurd mistakes outlined in a movie made some 40 years ago? If anything, the film’s basic premise and themes are as pertinent as ever. Underneath all the movie’s jokes and gentleness, The Russians Are Coming, the Russians Are Coming knows that war is a nasty business and there are rarely any victors. The Russians Are Coming, the Russians Are Coming has often been compared to It’s a Mad Mad Mad Mad World (1963) due to it’s title, characters and a large cast that happens to have some similar actors including Jonathan Winters, but I think The Russians Are Coming, the Russians Are Coming is a much stronger film that is willing to explore big ideas that were not very popular at the time that the movie was made, while keeping its tongue firmly planted in its cheek. Apparently the movie was banned in the USSR after its release, but it was nominated for a Best Picture Oscar in 1966. The script is based on a novel called The Off-Islanders by the American author Nathaniel Benchley who happens to be the father of Jaws author Peter Benchley. I find it amusing that both men wrote books set in small New England towns where they were raised. And both stories focus on a town being terrorized by some unknown scary “other.” It’s also worth noting that one of my favorite American filmmakers, the great Hal Ashby, also acted as an editor on the movie. These days it can be hard to find anything worth smiling about but if you haven’t seen The Russians Are Coming, the Russians Are Coming I recommend giving it a look. It just might make you laugh. The movie is available on DVD from Amazon and it’s playing again on Turner Movie Classics Nov. 28th when the great actor Brian Dennehy hosts four of his favorite films. I really like Brian Dennehy so I was happy to discover that he selected the film to play with two other films from the sixties, Karel Reisz‘s gritty British drama Saturday Night and Sunday Morning (1960) and Bryan Forbes‘s British comedy The Wrong Box (1966). I’ve wanted to see The Wrong Box for years, but it isn’t available on DVD yet so I’ll be watching it on TCM Nov. 28th. Hey Kimberly. What a great blog. I haven’t seen this film since I was a kid. I loved it back then. Me and all my friends laughed so hard watching it. I’ll have to give it a shot now to see if I still enjoy it as an adult. It’s nice to see that you’re a fan of it as a child and adult. I do think this film has a timely message for us now as well as then. We can never let mass hysteria rule our lives. We’ve got to keep our wits and reason. There’s always a new boogeyman out there. Thanks for your enthusiastic comment Keith! I think you’d still find things to like about the movie if you saw it again. Reiner and Arkin are really good in it and I can watch John Philip Law in anything. Alan Arkin has always been one of my favorite actors and I love him in this. He gave so many great performances in the sixties (Wait Until Dark, The Heart is a Lonely Hunter, Catch-22 (1970)) but for whatever reason he just never caught on with the masses. I’m so glad he finally won an Oscar but I wish he’d been nominated more in the sixties and seventies. I watched this again the other night too and I still find it enjoyable. I think it’s compared to It’s a Mad, Mad, Mad, Mad World also because it’s one of the last of the “sixties” style comedies before the whole modern sense of comedy took over with works in the mold of Richard Lester (frenetic pacing), Mel Brooks (crude, off-color humor) and Woody Allen (one-liners, dialogue comedy). A combination of Lester and Brooks (fast-paced, very crude) still dominates comedy to this day. This movie really feels gentle and warm in comparison to what followed. It has a sense of ease with its subject and doesn’t make you squirm with awkward slapstick. And aside from Arkin, I agree that Brian Keith and Carl Reiner are very good indeed. But Arkin’s my favorite. What a talent he is. Thanks for great post, and so glad you have TCM now. I’ve had the opportunity to see so many movies again from childhood thanks to this channel and I’m glad now that you can too. Thanks for the feedback Jonathan! I totally agree with you about Arkin. I’ve always liked him a lot too. A couple of his other best films are the wonderful but rarely seen Little Murders (1971) with Elliot Gould, which Arkin even directed. He really didn’t get enough praise for that terrific and funny film. I also like him in The In-Laws (1979) with Peter Falk a lot. I was happy that he won an Oscar too recently. He was really the only reason to watch Little Miss Sunshine since he was easily the best thing the movie (at least in my not so humble opinion). TCM has been terrific so far! I’m so glad I got to see Black Moon earlier (it might be my favorite Malle film now) and I’m really looking forward to watching the British comedy The Wrong Box soon. You can expect a review of it here after I do! Well, since you brought up Little Miss Sunshine let me say just a couple of things about it. First, it’s fairly innocuous so I can’t say I have any intense like or dislike for it. And I thought everyone was very good in it although Arkin was my favorite. My problem with the movie was in the extraordinary convergence of catharses going on. In the course of one short road trip the father discovers his business plan/book is a failure and won’t happen, the brother-in-law sees the student he loved and almost killed himself over in a gas station on the highway and the son finds out he’s color-blind and can’t get into the Air Force because his little sister just happened upon a color blind test at the hospital. She happened upon a color blind test??!!!?!?! And all of these problems are compounded by the fact that the grandfather has died and is in the back of the van. It all just felt too clever, too convenient and too cliched. Had it passed by unnoticed except for Arkin I probably would’ve liked it better but given the praise heaped upon it I found myself at a loss to understand its appeal to critics. I fully understand its appeal with audiences. Again it’s innocuous enough that if people want to be mindlessly entertained for a couple of hours with cliched characters I accept that’s pretty much how it goes. But the critics, people whose careers require they see hundreds of films a year and thus become acutely aware of cliche, that I couldn’t understand. I walked into the movie under the distinct impression that I was going to be seeing something on par with the best Woody Allen observational character comedies. Ahem… it was not. You may thought about the movie a little more than me Jonathan but thanks for sharing your thoughts on it. I just felt it was a predictable and rather dull dramedy that Hollywood/Sundance has been releasing on the public for years now. The whole story got on my nerves. Also, all the critical hype about the movie completely confused me… but it often does. If Arkin wasn’t in it I couldn’t have gotten through the movie, and by the time he left I was ready to stop watching the damn thing. 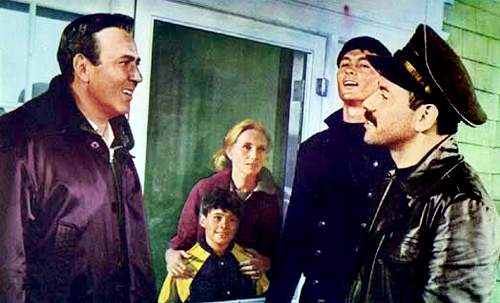 Still, I liked the film and love many in the cast, including Arkin and Law. Thanks for sharing your thoughts Jeremy! I’m glad you got the chance to watch this recently. I think my main problems with Little Miss Sunshine were the hype surrounding it when I saw it and the sentimentality just didn’t really work for me. Arkin was terrific though! I wish the film had been all about him. As a russian viewer, I must say it’s one of the few movies where american actors speak russian rather good (maybe because of Mr.Arkin’s russian background). Usually russian language sounds awful even in contemporary movies – when everything is messed up. P.S. I found your blog just recently and I must say I’m really impressed – you’ve been doing a great job, thank you! I sure wasn’t looking for this but I stumbled upon this post today and had to comment. “TRAC!TRAC!” is one of my all-time favorite movies, for all of the above reasons (Arkin is wonderful) but for one additional: it was filmed not on the east coast, but in Mendocino, California, which is one of my childhood places. My grandparents lived there in the ’60s-70s, and my grandfather and his best friend were extras in the movie. The casting director wanted people who looked like east coast fishermen, and those two were west coast fishermen. 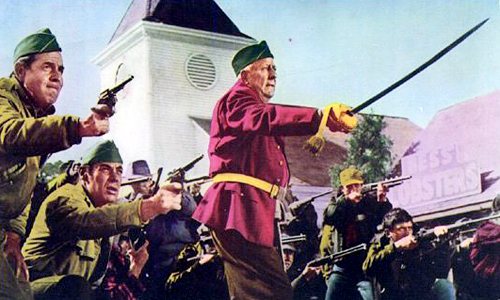 Papa showed up in his red plaid hunting jacket and furry hat with his rifle, and Cliff was similar attired. They were front and center during the angry mob scene, and in the above photo of the mob scene you can just see Papa in the bottom right corner (I think). The church in the big finale is the Mendocino Presbyterian church and is featured in nearly every postcard of Mendocino. My parents were married there. Papa’s only memories of the movie that he shared with me were all the “darned hippies” who elbowed their way to the front in the mob scene — take a look: do YOU see any hippies in that scene? and Papa was in the front row, ha ha — and that Jonathan Winters practiced mugging in front of a mirror to crack the extras up. Thank you for this unexpected treat, and for indulging me as a huge blowhard. No one I know knows this movie, so it’s fun to find people who appreciate it.